This photo is from Blue Hen Falls in Cuyahoga National Park, which is located between Akron and Cleveland, in a fairly urban part of Ohio. I’ll have more on the National Park itself in a later post. 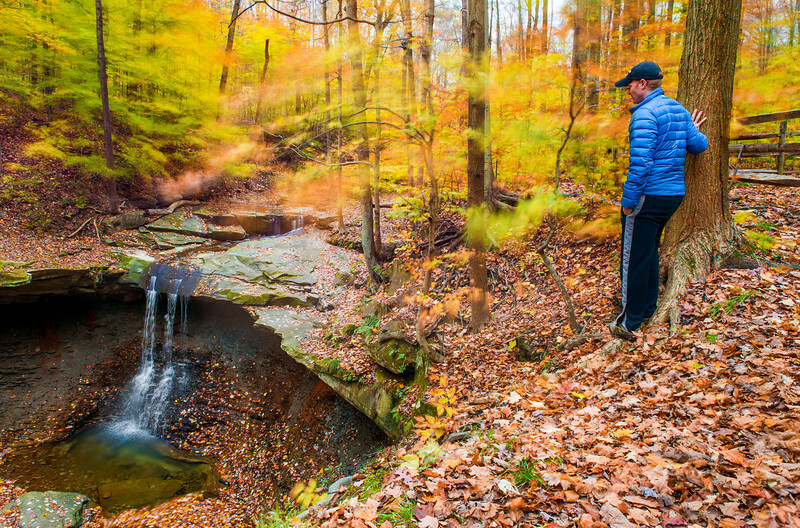 Blue Hen Falls is a pretty popular waterfall in Cuyahoga. Thanks to a tip from Kristin, I explored further (getting lost and having to be helped along the way!) and found a “secret” waterfall, too. I actually think I liked that one better. I’ll have to post a photo from there so you can be the judge. This was probably my last weekend of seeing fall colors (even though we are just starting to hit peak colors here in Indiana! ), but I can’t complain too much, having hit the Smokies, Acadia, and Cuyahoga all during this fall colors season. Next year I’m hoping to hit a few additional parks, so if anyone has any suggestions, let me know! If you look at photos of waterfalls on sites like Flickr and 500px, you’ll notice a trend: nearly all of the photos (not talking snapshots) feature silky-smooth water. This is a result of photographers using tripods and neutral density filters, polarizing filters, or being deep enough in the woods that they can simply stop down for a longer exposure. I’ll admit that this has a very pleasing look. The silky water imparts a sense of tranquility, and has a certain visual appeal because it’s not something we can see with our eyes, yet looks very natural. I think these shots are also popular because they use a more advanced technique to produce a more technically challenging photo, too. I have several of these photos myself. They look nice, and they’re worth taking. However, they are not the only type of waterfall photos worth taking, which is what you might be led to believe based upon looking at the most popular waterfall photos. Waterfalls are often found in the untamed wilderness, with water cascading and flowing wildly. They make us feel at peace and relaxed, but the waterfall itself is the epitome of “wild,” why not capture it as such? Due to the abundance of these silky waterfall shots, they aren’t even remotely creative or original. They’re just the type of shot you collect “just because.” There’s nothing wrong with taking some photos like this (everyone does–including me), but I think it’s also important to go for more creative stuff. Since almost 100% of waterfall photos have this “look,” literally anything else you do when photographing waterfalls is more creative. That’s not to say this type of shot can’t be creative with a different perspective or by adding a twist to it, but a lot seem to be straight-on shots were the silky look is the main “draw” of the photo. In this case, I decided to go for something different with the standard waterfall photo. Here, rather than using a mid-length (silky-waterfall shots are typically in the 3-10 second range) exposure, I went with a ridiculously long exposure to show motion in the leaves, giving the photo an almost impressionist look. I also jumped in the scene myself to introduce a human element (normally I’d have Sarah do this, but I was by myself, so I didn’t have quite as nice of a model!). Finally, I used a short exposure for the waterfall. The idea is to show the sense of tranquility that man feels when standing before a waterfall, but for the waterfall itself to remain wild, while the rest of nature is more at peace. At least, that’s the idea. The resulting photo may not be great, but at least it’s something I haven’t seen done before. Photographed with a Nikon D600 and the Tamron 24-70mm f/2.8 Lens with my Hoya 10-stop neutral density filter. I think this is my first photo on here taken with the Tamron 24-70mm f/2.8 lens. I had the Nikon 24-70mm f/2.8 for a brief period, but mine had an issue focusing, and I decided to just return it rather than exchange it. It was a really expensive lens, and it didn’t quite seem worth the money for my purposes. The Tamron 24-70mm f/2.8 is significantly cheaper, is roughly as sharp, and has “Vibration Control.” Overall, I think it’s the perfect mid-range full-frame option, unless money is no issue. Maybe I’ll do a full review of it later. Anyway, as to this shot specifically, it’s a composite of two photos (more on how to do this in tomorrow’s post). The first was taken with the neutral density filter, and was a 127 second exposure. It needed to be this long to capture this much motion in the leaves. Even then, I get really lucky that it was windy. I had this idea the weekend before when I was at Great Smoky Mountains National Park, and even in a 4 minute exposure, I had almost no movement in the leaves! I am a big fan of Monet, and have always liked his paintings of Giverny. I thought it would be cool to capture something reminiscent of those paintings in photo form, and while I wouldn’t even think of comparing this photo to a painting by Monet, that’s where my inspiration for the shot lies. For the other exposure in the composite, I jumped in the frame with the self timer set, and took a much shorter photo of the waterfall flowing quickly and me (since I can’t pose for 127 seconds). There are several things I would change about the photo if I could, but I like the raw idea here, and I hope to refine upon it. To me, that’s the fun part of photography: experimenting, testing, adjusting, and refining an idea. Processing (besides the composite–which was pretty easy) was very simple. Just adjusted the colors in the photo that used the ND filter, and increased the contrast and blacks. What do you think of the idea here? If not, would it change your answer if you also knew that I saved fifteen whole dollars by not having to pay for a camp-site?! Hearing from you is half the fun, so please share your thoughts in the comments! Brasileño, Chileno y el Colombiano entre otros muchos. las 18:cero horas de España. I’m glad you liked this place! During the summer it can get pretty busy there (makes for some fun photos though), but you went at a good time. Although, the weather that weekend wasn’t so desirable. I agree about normal exposure waterfall photos. I tend to enjoy capturing the water mid-fall, there’s something special about it. I have seen a few photos of long exposures that I enjoy, ones where the water seems to have a vortex happening. Not sure what it is about those that I like – I guess it’s an unexpected pattern in the water that draws me in. Looking forward to seeing what else you got (and a review of Melt?!). Thanks for all your tips along the way! As for Melt, I didn’t end up making it there. After trying to wait out the rain for a few hours, I decided to just cut my losses and head home. What do you know, as soon as I made it about 20 minutes away, the skies cleared and there was a beautiful sunset. Just my luck to miss that. I like the contrast of the “still” waterfall and the movement of the leaves creating a faux-wave pattern right above it. Yeah. I think the contrast would be more striking if the waterfall were nearer to the leaves (it was a decent distance below, and is a small waterfall, anyway), but I still like the look. I like my waterfalls to be wild…but I love the leaves in this photo. Thank you for a small taste of home as I grew up in this area. Thanks! I’ll have more photos from Cuyahoga Valley National Park to come! I really like this shot. As you say, it’s quite creative. I was wondering what was up with the trees, since you and the waterfall looked to be short-exposure. Since I know nearly nothing about photoshop, compositing didn’t enter my mind. For leaf suggestions in a similar driving distance, Hocking Hills (state rather than national park) it quite pretty. It’s probably a little closer to Indianapolis than Cleveland/Akron. I think it’s prettier than the Smokies (there are mouintains, but the varied terrain and cliffs can be beautiful). It’s not fall-related, but I’d love to see your photographic take on Mammoth Cave as well. Mammoth Cave is high on the list of places to visit soon. I know they have a lot of rules about cameras and a no-tripod policy, so that might take some doing. But it’s only 5 hours from here, so I’ll likely cross it off the list within the next 6 months. I’ll have to keep in mind Hocking Hills. Right now, of the National Parks are top priority, but there are only so many of those that qualify as being weekend trips, and I’ve nearly exhausted that list. I haven’t been to Mammoth since I was a kid. We’ve been thinking about driving down there some weekend ourselves. I didn’t realize they would/could restrict tripod use at Mammoth. I’m not sure how a 3-5 lb tripod would damage a cave formation more than my 150 lb foot would. Amusingly the Mammoth website I found lists some helpful photo tips, such as: “Use a flash, especially with disc, instamatic and Polaroid cameras.” Good to know in case I decide to bring along my 1980’s Kodak dics camera!